Recently, I spoke to a friend who is all set to embrace motherhood in all its glory. Now, I’ve known this person for a long time, and she loves what she does for a living. And mind you, she’s pretty darn good at it. But the more we discussed parenting and how life changes after kids, the more it became evident to me that there was something she wasn’t telling me. As people who’ve known me for a while can confirm, I usually diplomatically manage to coerce get the person into revealing what it is. Anyway, as it turns out, while she was ecstatic about motherhood and everything associated with it, she was also concerned about a few things. One of these things was ‘returning to work’. Because as I mentioned earlier, she is someone who enjoys what she does and for her to not be able to put in the same amount of effort post-motherhood, would - in all sense of the word - kill her. Curious, I asked her - why should her becoming a mother, affect the way she worked? After all, people successfully do both. She looked at me and said “Guilt”. And her one word answer, got me thinking. I’ve heard the phrase ‘parenting guilt’ being thrown around quite a lot, and perhaps one of the reasons that I wasn’t too affected by it, was because, well, I rarely feel guilty about anything. For starters, if I did, I wouldn’t eat so much cake and be such a rotund person. (Yes, I noticed the smirk.) Perhaps, it is also because I don't think I've done anything that wasn't justifiable in my book. But I couldn’t let go of what she’d said; so I pondered over it for a few days wondering if others felt the same way. I started to ask other working mothers in my group - friends, fellow bloggers and ex-colleagues. And I was surprised to hear that at times, a lot of them felt guilty in some way. Some felt guilty about not being able to spend as much time as they would have liked to with their kids. Some others felt guilty about actually enjoying their work, despite having a little one at home. Yet some others, felt guilty because society made them feel like they weren’t doing enough. And some others felt guilty about the fact that sometimes they felt the urge to have some ‘me-time’. And that’s when I realised that I had an example - a fusion of these, perhaps - right at home. Not everyone can juggle all the different roles as you can, with such relative ease. So relax, you are doing a splendid job. Yes, I know - at times, you may feel like you’re not doing enough for your kids or sometimes even feel left out of the little ‘ecstatic moments’ of joys that you may otherwise get to share with the kids. It’s only human to feel so. And of course society will lay down their rules of what’s the right way to bring up a child and what isn’t. But pay no heed. You’re all superstars. And since we’re on the subject, remember that while your kids are a pivotal part of your life, there is no need for your world to revolve around them all the time. The presence of your kids should augment the sweetness of your life, like how a spoon of sugar can do for a cuppa, not shackle your conscience. You deserve to take some time off for yourself. So the next time, if you feel you’re not doing enough or being there enough or giving enough, remember that it is okay to go out for a meal or a movie or even a mini-vacation, just by yourself or with your better-half while leaving the kids with grandparents or extended family. Or to take time off to do things you like - be it writing, reading, painting, or even just lazing on your couch, watching your favourite TV show. Or even just enjoying the work you do. And most of all, it is okay to ignore what others may think of you as a parent. Your parenting style needs to be shaped by your situation and the environment that your family is in, not by some social expectation, external pressures and unwritten rules of how to bring up your child. Regardless of what the ‘parenting police’ say, remember that there is no ‘Perfect Parent’ award. So just be a real one. You are a human being, not superwoman (or man). It wont do you any good to be riddled by guilt set by expectations or to be anxious or exhausted. Instead, what time you do have with your kids, make sure you become a happy, good-humoured role model showing them that it is perfectly possible to balance priorities in life. I'm curious - What do you think? Do you think parents need to feel guilty about working? Or even having to want some 'me-time'? My little one spent the first month of his earthly life in a transparent, rectangular box measuring 60 x 40 cm, and attached to different machines by coloured wires of all sorts. I suppose it’s safe to say that, for the first month, we hardly heard him cry. Rather our association with a fully mature baby was the intermittent noises and beeps that these monstrous machines emitted. No one knew what was wrong. Or what had caused it to go all wrong. All we knew - was that something was very wrong. And so we hoped. Prayed. Cried. Comforted each other. And watched his little pink, tummy, gently rumble as he slowly breathed in the disinfected air of the Intensive Care unit that had become his first home on earth. But this post is not about him. This post is about someone else. No, not me. But about his mother. His mother, who went through all the ups and downs of pregnancy. His mother, who despite often shedding a tear from the prick from a needle, somehow found the strength to keep going through the dreaded contractions. His mother, who bore the brunt of the eight-hour labour, when he decided he didn’t want to come out. His mother, who he almost bled out trying to escape from the womb. His mother, who put on a brave face, when the nurse said he had to be admitted to the ICU, within hours of his birth. And his mother, who spent sleepless hours sitting by the glass box, waiting for a positive sign. That thankfully came. I still remember the first few days, after my little one came home from the hospital. All of my paternity leave had been exhausted while he was in the rectangular box, talking to us in beeps and numbers. I still remember how I woke up in the morning and almost called in sick. I just wanted to spend every single second with him. But such is life. As the sole earning member of a three-member family, I had to work. So fighting back emotions, I went to work. I’d call every hour to check on what he was up to and how he was doing. Over the next year, I cribbed as I heard about all his firsts - the roll-overs, the crawls, the holding fingers….every single thing. I think I might have even blamed his mother, for the fact that I was having to work while she sat at home. And then a year later, the equation changed. I had the opportunity to stay at home (while working on a few bits and pieces, of course!) while she returned to work full time. In my stupid little head, all I saw was: yes, this was my turn to rub it in. To tell her every single thing that she had missed while she was slaving it away. But there was something that I never realised till much later. If as a father, whose part in the birthing process was largely one like the proverbial stork delivering the baby, I missed the kid so much - how would a mother feel? I started to realise that every single time I mentioned about my son’s milestones, underneath his mother's smiling facade, was a heart - bleeding from every blow, my words inflicted upon it indirectly. So today, I want to apologise - to my wife, to the mother of my child, to every single mother - who works and has to spend time away from her off spring(S), by choice or not - you are truly are my #sheroes. And the full-time mothers, you too. Anyone who tells you that you’re sitting simply at home because you chose to spend more time with your family and kids, well, they’re idiots. You rule. Yes, you….I’m talking to you, right there at the back, smirking as you see my wife leave for office in the morning. Yes, you too, who trivialize her motherhood just because she also chooses to have a career. And you, let me not forget you, who thinks that she shouldn’t have a kid (or future kids) at all, unless she’s ready to forgo everything and sit at home looking after her little ones. Well, I’ve got news people. Whether you like it or not, she’s a mother. And a damn good one at that. So shut it! P.S. This started off as a status and as I rambled along, ended up on the blog. It's unedited and may have typos and errors. Kindly excuse. I don't care what she says, I really wanted my wife, Janaki to write this post. And it took a lot of convincing to get her to write out her "rants and thoughts" as she calls them. But I finally managed to get her to grace my blog. If I did take part in the #100 days of happiness thing, this would undoubtedly be up there on the top. So, without further ado, here goes - Ladies and Gentlemen, my wife Janaki, with her first ever guest post. Do give her a round of applause and leave your comments in the box below. 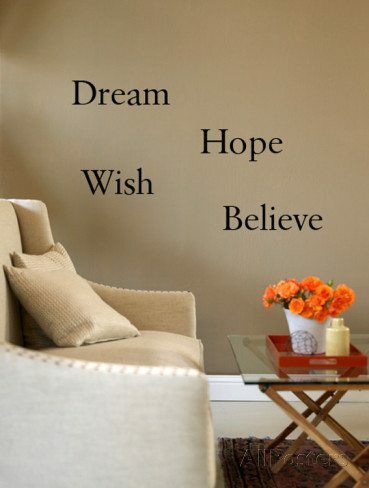 Wish, hope , believe - To me, these three words are independent, yet interlinked. To me, they signify the triumph of the human spirit and of a never-say-anything-is-impossible attitude. For if you don’t wish, you can’t hope. And if can’t hope, then you sure as heck, aren’t going to believe that it can be done. So when Sid asked me if I wanted to do a guest post on the prompt "What are the six impossible things you believe in?”, I was a bit stumped. Whilst I know for a fact that he asked me to write a post, because he was busy working on a “finale” to his short story, I did find the topic quite intriguing. But I didn’t want to write about Fairies and Santa Claus and Unicorn and Magic and the rest. (For the record, I do believe in them ) I decided that I was going to “twist” (Sid’s own words here) the prompt around and write about two things that I wished for, two things that I hoped for and two things that I believed in. And well, this is it. Before I go ahead, I’m going to take a minute to thank Sid. Yes, you heard right. I’m thanking him for all the compliments about me (and every other mother) being a “Superwoman” in one of his recent posts. Yes, I manage being a working woman as well as a mother to rather naughty toddler. Yes, it’s also true that I probably have it a little bit easier because Sid helps me out too, in whatever way he can (though there are days when I wonder if I have two kids). The truth is I manage somehow. But there have been days, where I’ve had to leave an unwell Rishi at home, because I couldn’t afford to miss an important client meeting. There have also been days, when after putting him to sleep, I’ve worked away through the whole night to meet a deadline. Yes, I manage. But I want to do so much more. I want to be able to be there for my son, whilst not compromising on my work either. If only I could come home from work with 100% charge, like a smartphone taken off charge, and pay my undivided attention to my little son. But then again, there is dinner to think about. Oh, what I wouldn’t give for one of those “Time-Turners” that Hermoine had, in the Prisoner of Azkaban. Things would be so much simpler for a working mother. It could very well be, that I’m the only pupil from this school of thought, but I’ve always wondered why we need to do things, just to make people happy. No, I’m not talking about phoning an aunt that you haven’t spoken to in ages to wish her for her birthday, just because your mom played one of the many “you-owe-me” cards. Or being a nice to others and generally polite. I’m talking about words like “love”, “thank you”, “sorry”, "please" and plenty more adjectives being thrown around without people actually meaning it sincerely. I mean, if you do care, then make an effort to say so. People who know me well, will tell you that I don’t do that. I do things only when I strongly believe in them. For eg. I believe in apologising when I'm in the wrong. But I'm not the kind who keeps saying "sorry" over and over again, without actually meaning it. For if I was truly sorry, I wouldn't repeat it. But these days, people think they can get away with everything if they say a "sorry" or "just kidding".The problem with that is that it often makes me come across as a snob. But then again, do I actually care about what others think of me? I’m sure you know the answer to that one by now. I hope, because I know it is possible. When I was in London, I’ve travelled alone a number of times. And sometimes during rather un-earthly hours, say post 1am. The transport network operates perfectly and you can go where you want, when you want. Why, I’ve even taken a cab flagged off the main road, without wondering if I was going to be safe. But now that I’m back in India, I don’t even try doing anything like that. I’ve been reduced to having to take my trusty little can of pepper spray. And I hate that. As much as Sid tries to make sure I have my space, I hate that I’m not able to step outside a 5 km radius, without being inundated with calls from family concerned about my safety. Which eventually makes me treat every man, woman and sometimes a child, with suspicion. While the media, the NGO’s and the politicians have all been playing the blame game, no one has actually benefitted. Yes, I’m an “Aaj Ki Naari” (Modern-day woman) so to speak, but I’ve been reduced to a situation where I have to think twice before I venture out alone at night (or even during daylight sometimes) without a male companion. And I hate it. Having had the chance to stay abroad for a number of years, I’ve had the opportunity to observe a lot of people. Especially a lot of familial relationships. Both the parents and the kids are relatively independent. The kids are often biding their time, till they can “move out” of home. And the reality is that in a lot of families, as soon as kids hit their teens, they do just that. Yes, they probably return for their Christmas or Easter breaks, but apart from that, they are busy for the parents. Yes, I understand the need to be an independent person. I'm one too. But I can’t even start to imagine leaving my parents in an old age home, not just abroad, but even in India too. Of course, I am not painting every one with the same brush. But the amount of “retirement homes” popping up (which by the way, is just a fancy term for an old-age home) frankly scares me. Yes, it took me time to understand what my parents have sacrificed to take care of the three of us. Often, I hear my parents and in-laws talk about arrangements that they would like to make, if the inevitable happens to one of them. And, I end up getting offended. Because the mere thought that someone could be reluctant to take care of their own parents is, well, let’s say almost blasphemy. But then again, I guess when their “friends” are being offered similar solutions by their off-springs, they can’t help but think that we may behave the same way too. Even though I’m an engineer, I have my share of issues with technology. The more Sid and I discuss this topic, the more we agree to disagree. Of course he’s a social media addict. And frankly, I’ll be surprised if he even decides to publish this point. Here’s the thing. According to me, technology is something that is supposed to aid communication, and not become a substitute to communication. There is a very thin line between the two. I sincerely can’t remember the last time someone said, “I’ve got some happy news that I need to share. Let me call them!”. Now, we just tweet about it, or Facebook it. Recently I received a marriage invitation from a close friend. It wasn’t a phone call as I would have expected. It wasn’t even a personal email. And this is someone I’ve known for over a quarter of a century. Someone who even calls my mother, Amma. I got a rather impersonal Facebook group invite. Honestly, I wasn’t sure how to react. Of course I complained. And in turn, I was told “Oh, you’re too old fashioned”. Today you receive most information such as child birth, marriage, promotion, and sometimes even death, through social media. But then honestly, hasn’t it been a while since technology started replacing communication. Forget communication, think about this. How many times have you stopped in between having a really good time with a friend, or your family and said “Here, let’s take a picture. I need to put it on Facebook.” I do my bit of sharing on Facebook too. After all, it is probably one of the best ways to share. But the lack of "social etiquette" and "opening out your entire world, from what you had for breakfast to what you're going to do next? ", sometimes is a bit too much. Just my opinion. This also goes for all the people who keep at their keypads (oh sorry, touch screens) whilst at social gatherings, birthdays or dinners. Sadly, my husband is one of them too. …. that at some point in my life, I will go travelling the world. I guess Sid’s “writing” has influenced me a bit more than I gave him credit for. I have no other explanation as to how I weaved my way through completely random topics from “Time-turners” to “retirement home” to “social media”. And with that, I shall take your leave. Thank you for taking the time to read some of my thoughts (and rants) on some really random topics, which remain close to my heart.